Rated 5 out of 5 by pennmom36 from Family Curse Witches' Legacy has turned the page, giving us a new chapter and a brand new curse. Without straying too far from the original saga of Lynn Watson and the battles she fought to use her magic only for good, this storyline is very fresh and exciting. Jack has just arrived at his mom's house for dinner, only to find utter chaos. Her exotic plants have become somewhat intimidating, with big eyes and even bigger teeth, poor mom has been cursed with an aging spell and little sister Nikki has been abducted by Cassandra an evil witch! It's become abundantly clear that Cassandra has no use for you, and you soon realize that the Aging spell has been cast upon you as well! This is the cruelest of spells, as your body begins to rapidly deteriorate until you're merely dust in the wind. Can you find the strength to defeat this darkness before your frail aging body can no longer function? I love the fact that the features from the previous games have remained, and are available in the Collector's Edition. There are 36 Collectible Puzzle Pieces that will form four different jigsaw puzzles that can be set as screensavers, and there are 34 Morphing objects to discover as well. I also enjoyed how the story intertwined with the original story, linking them together flawlessly. The graphics aren't over the top fantastic, but, they are decent, and the cinematics are very well done. Since the Imp (once family dog) belongs to Lynn, we get Bertha the ferret (once human) to help us out during the adventure, (Not nearly as cool as the Imp unfortunately) and there are several Achievements to earn as well. 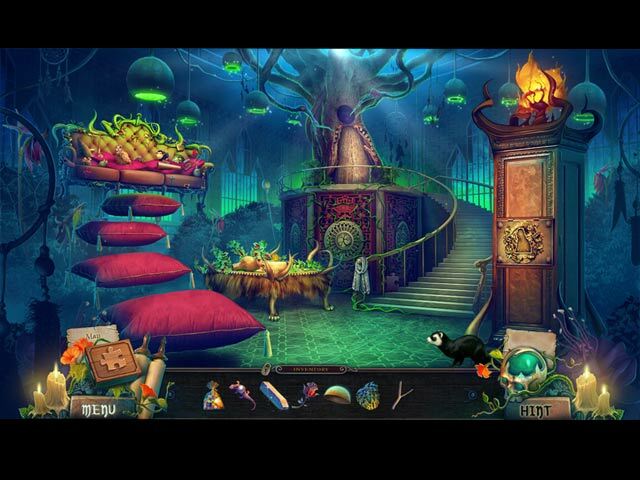 The Hidden Object Scenes are quite entertaining, there are several "zoom zone" puzzles, typical in this series where you are tasked with finding six fragments, items, or six symbols needed in the zoom zone, by searching the scene outside of the zoom. The HOP's are presented in several stages, first you may need to find four items that match the shapes shown, which will open up an interactive list, and when each list section has been found there will be fragments given to assemble, almost every section will give you bits and pieces of the story's background. You can also opt for a game of Mahjong if you're not into Hidden Object Puzzles. The Mini Games were a bit of a disappointment for me because they all seem way to easy with no complexity at all, but they aren't bad puzzles, they're just easy puzzles to solve. I've listed brief descriptions on some of the games you'll encounter during the demo: 1) Place gears to form a continuous chain reaction, then select the gears in the correct order lit as demonstrated. 2) Melt skull tokens using amber tokens with directional arrows. 3) Place square tiles correctly to form two separate pictures. The Collector's Edition has 9 Wallpapers, 4 Screensavers, 9 Concept Art pictures, 3 Music Soundtracks, 12 Achievements, 36 Hidden Jigsaw Puzzle Pieces, 4 Jigsaw Puzzles, 34 Morphing Objects, a built in Strategy Guide and a Bonus Chapter, enjoy! Rated 5 out of 5 by biscuitsmama from A NEW LOOK AT THE WITCHES' LEGACY SERIES Quite frankly I had hoped that the Witches’ Legacy series had finally met its end after the last game so I was quite surprised to see yet another one come along. I was becoming quite bored with the series even though I love the dev and always look forward to their games. We now have a new saga in the series and it is sort of a prequel I guess as I am having some difficulty coming to an understanding of the story. There is a tie in of sorts that I am sure will develop as the storyline evolves. Awakening Darkness begins when you (Jack) arrive home for dinner with your mom and sister Nikki. What you stumble on when you open the door is almost beyond belief as you see a witch who has possessed your sister and turned your mom into an old woman. 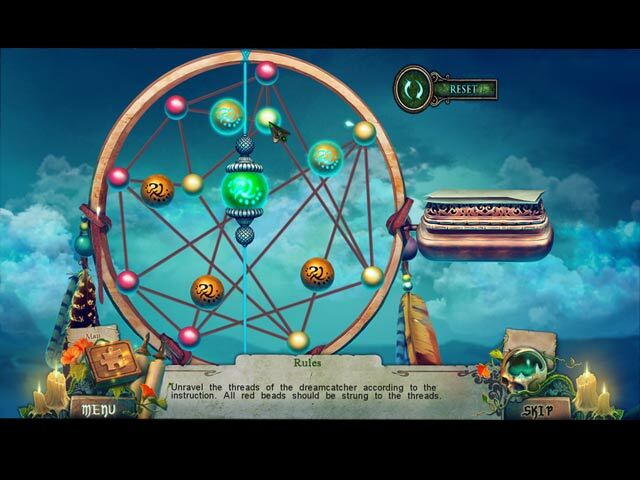 Will you be able to save the day and restore the balance before you too succumb to the witch’s curse and turn to dust? The graphics are quite good and very colorful. One of the things I enjoy most in games from this dev is that there is such attention to detail and one never knows what will respond when items are clicked. IMHO, I have almost as much fun clicking around the screen to see what happens as I do playing. It must take a huge amount of work to make all of the little items in a game respond and I certainly appreciate the effort the dev puts into their games. I love the interactive map that is provided in games from this dev. The map not only helps us transport quickly from place to place but it also shows where we have collectibles and morphing objects to find – a very helpful feature. The HOPS and puzzles are just about what we would expect to find with some being multi-level and very interactive. The puzzles are easy except I always hate the “Simon Says” type where we need to repeat the sequence. I always struggle with those and once I hit my tolerance level I need to use the skip button. As is usual for this game dev the CE version has collectible puzzle pieces and morphing objects hidden in each scene. Sometimes the morphing objects and collectibles are difficult to spot but I don’t give up until I find them. The rest of the CE content is the standard stuff that we expect to find in CEs. That being said, I think the collectibles and morphing objects make the CE very worthwhile. Do I like the game? Well, I certainly appreciate the new storyline that is different than the overly-done story of Lynne and Edward. I appreciate all of the fun little details in the game along with the excellent graphics and sound package. All in all it is an entertaining game and one that I am enjoying as I delve into the tale of Morgana, Cassandra and the new family they have caught in their snare and battle of the witches. Even though this game is perfect for me, please try the demo to see if it is one you will like. Rated 4 out of 5 by rpggramma from Good Game. Good game, interesting. Not Gory! Seemed fairly long to me. Enjoyed, but got kind of confused as to who was who; needed a little more info! Graphics, HOs, puzzles, all was good! Fun game, lots to do. Recommend! Rated 4 out of 5 by kes_d from Enjoyable but not one of their best The graphics and effects were good quality but I found this version quite easy and not really very challenging. If you want a fairly long game that you can breeze through - this will suit you, but more experienced players may find it far too easy. Rated 4 out of 5 by Aliana_4711 from Very imaginative. Awesome visuals. My ranting is based on completion of SE and fulfillment of most of my personal requirements. These are: - First of all, a decent length, I needed something between 4 and 5 hours. That’s ok. - Good graphics: they were awesome and magnificent. - A lot of location can be discovered. They are plotted extremely detailed and marvelous. Sometimes, it reminds me of Alice in wonderland. A little bit surreal and a kind of fantasia. - Very well animated. - Good Voice over, matching the characters. But why do witches (as well as sorcerers in other games) always have to laugh so awful? - Tools: An interactive map, a bewitched girl in form of a ferret. And Annabel, your companion who can vivify something. 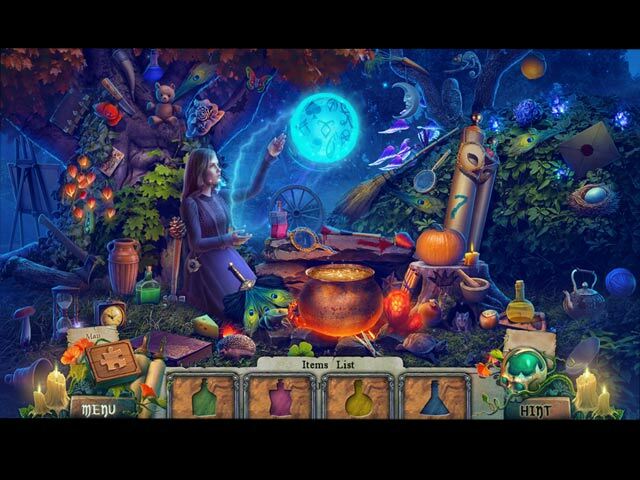 - Good Story: According to the previous “Witches’ legacy” games, you have to stop a witch. This time one, who possesses your sister. - Different and interesting HO’s: They were really good and slightly interactive, you can switch to matching pairs. - Mini games: They very mostly easy, but clearly well done. - Challenge: The tasks were logical, but not that easy. - Lovely gimmicks along the game. Click and enjoy. Minor dislikes: Difficulty to be customized. You can choose: map issues - combined with hint recharge, sparkles at HO’s, glitter, skip recharges. Unfortunately, you can’t exclude helping texts as well as contextual pointer or plus-item. Hint recharge time may 35 sec, skip recharge time may 50 sec. For my liking to short. Rated 3 out of 5 by roaming from Childishly Silly and Trivial No creep factor here. Lots of cutesiness inside a very shallow plot. Talking ferrets with happy little girl voices aren't my thing. I didn't bother to finish the demo. Neither yes or no to a recommendation. Some will like it. I found it all too, too silly. Rated 3 out of 5 by bessiegirl from Glad it was on sale.... This game was like Alice in Wonderland on Steroids. A lot of nonsense with constant back and forth movements. Click here, get an item here go back there...got really old and I was glad the game was over. Voice overs were absolutely awful. Sounded like they just brought people in to read a script who had no clue how to do it. Just awful. Lots of cut scenes, puzzles and HOS. One thing for sure, a lot of very weird creativity and imagination went into this. Sort of lost track of the storyline since there was so many characters and things going on. Some inconsistencies which didn't make sense too. Rated 2 out of 5 by BettyBoop277 from Issues! Game froze after a few levels, so I deleted and redownloaded, game is now totally frozen. The only thing that responds is the menu! Rated 2 out of 5 by PATinPNS from Maybe I'm Just in the Dark This is posted after playing the demo. I swore off supernatural games a while back, and this is a good reason I did. I have all the games from the series and thought this might be a new and better version, but I was wrong. It's a non-sense, makes no illusion of reality whatsoever, and was just simply a bore. It was not fun for me. Graphics and voice overs were excellent as usual. The FX went along with what action was in the scene and the music, while nothing to write home about, was okay. I really did like the colors in the scenes. I found the mini games to my liking. I could actually do them which is saying something. Didn't really care for the hidden object scenes. Usually there is a common theme to them, but these just seemed to be put together. They weren't all bad, but the majority were not to my liking. The interactive map was a must. It will teleport you to various locations and thankfully shows where there is something to be done. Otherwise I would have been lost most of the time. There are several difficulty settings and I chose custom so I didn't have to wait for the skip and hint buttons to charge. The story was about as far fetched as they get. I can only think of a couple games that were worse. At least in the old series, the story worked together with the action. This one didn't seem to follow anything. You pick up this or that and will use them, but the results just didn't seem to make any difference in the story. Perhaps the whole game would provide a better basis for the story, but the demo left me wanting. Give the demo a shot. Since I seem to be in the minority on this one, perhaps you will see the light where I was in the darkness. Just wish they would get away from the witches and ghost themes in these games. That is getting mighty old. Rated 1 out of 5 by mom12x from What a waste of time I rarely write reviews for these games, but this game was so awful, that I felt it necessary. This seems like a game written for kids, with kids in mind, not adults. I bought it without playing the trial (I rarely do that) based on the reviews. I feel like those folks who loves this game must either be children, or they played a different game than I played. The story is lame, and characters are lame, and quality was horrible. The games were so easy, there was no challenge whatsoever. It was like the worst comic book quality.